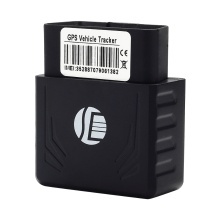 This device through GPS and AGPS double position provide more accurate and fast position. Smart saving location data, when recovery the GSM signal, reupload location data of the blind area. Multi-function alarm, dismantling alarm, vibration alarm, transboundary alarm, over-speed alarm, moving alarm. There is smart mode, low power consumption, save power and GPRS cost. Free installation, easy to operate, just need to insert in OBD interface of car, you can use it, won&apos;t damage the original car line.